Do not adjust your website browsing software, you read the headline correctly. Metallica have teamed up with Lou Reed to record 10 new songs. UPDATE: Lou Reed and Metallica: inspired collaboration or insipid ego vomit? Vote in our Facebook poll and let us know! According to 'Rolling Stone', the album came about after the thrash metal kings backed the Velvet Underground man for two songs at a Rock And Roll Hall Of Fame concert in New York back in 2009. The new album will consist of 10 songs written by Reed for a stage show currently running in Berlin ('Lulu'). Originally the band had planned to record a selection of unappreciated 'deep cuts' from across Reed's career. James Hetfield told 'Rolling Stone': "Lars and I listened to the stuff and it was like, 'Wow, this is very different'. It was scary at first, because the music was so open. But then I thought, 'This could go anywhere'." 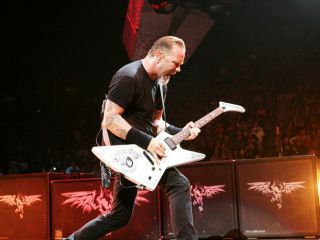 Metallica say the album is almost complete, but as neither artist currently has any label commitments, it could be a while before fans see a release. TG hopes they hurry up, because we cannot wait to hear it. In the meantime, have a look at our Metallica 'Enter Sandman' guitar lesson.